When a young woman known to be associated with mobster Little Big Bog goes missing, her childhood friend hires Detective Gilbert to take the case and find out the truth behind her disappearance. So far so standard, right? But in Expera Games Studio's point-and-click adventure A Matter of Caos: Episode 1 (no, that's not a typo), our Detective isn't so much hard boiled as he is squishy, purple, tentacled, and rocking mind powers, though he's hardly the weirdest character lurking around the unseemly shadows of Mavropolis. To find your mark, you'll need to travel around the city, solving puzzles and greasing palms, and hopefully not getting devoured by ferocious infernal guardbeasts in the process. As you make progress, more locations will open up around the city. To play, just click to interact with things, though the game is primarily text-based and people to talk to or items to use are represented as icons onscreen. At the bottom of the window is your inventory... click an item to "equip" it to use on something, or try to combine things you're carrying. And don't forget... if you like the game, please support the developer by buying the "complete edition", which contains some extra content, and goes toward funding bigger adventures with Mr. Gilbert! A Matter of Caos: Episode 1 Walkthrough now available! A general tip is to talk to everyone about everything. Gathering information and making the connections is the most important part of the game. Start off by opening Mr. Gilbert’s desk and grab everything inside. Go to the police station to see if they have any clues on the case. Since Hyevni won’t speak about Daphne, you’ll need to bribe him. Go to the Trembling Stars and head into the alley. Grab the Old Battery and combine it with the Empty Vial to get the acid. Head back to Mr. Gilbert’s office and use the acid to open his safe. Now that you have the money to bribe Hyevni, head to the police station and see what you can find out about Daphne. Ask him every question which is available. Head to Daphne’s apartment and use the Fang Shard to pick the lock. Take a look at the wallpaper, cut it with the Paper Knife and grab everything inside. Examine the glass shards on the ground with the magnifying glass to discover a Tissue Sample. Go to the laboratory and ask Doc Miphidas to examine the Tissue Sample and the Necklace. Head back to the Trembling Stars and into the alley where you’ll find a sick guy. If you talk to him, you’ll notice that, apparently, he knows Daphne. Show him her picture and explain the situation. Now you can get into the club. After you’ve tried to gather information about Daphne, head back to Mr. Gilbert’s office. 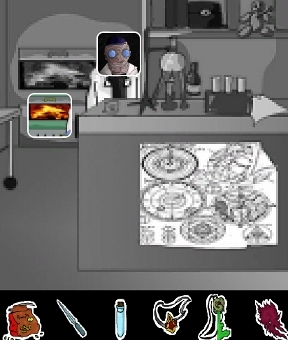 Go to Doc Miphidas’ lab. To get the Powerful Narcotic distract the doc by throwing the Unexploded Bullet. Grab the potion and go back to the Trembling Stars. Combine the narcotic with the peanuts and mix them with the ones the drunk guy is eating. Once he falls asleep, pickpocket him to get the keys for LBB’s office. Go to the back corridor and sue the keys on the locked door. Take a look at everything inside, then use the Paper Knife to find a hidden drawer with some valuable information inside. Talk to Little Big Bob and show him your powers. Offer to read his blood to gain his trust. After you’ve talked to him, have a chat with the girl at the bar – Trixel. Go to the back corridor and enter the Bathroom. Inside the WC, you’ll find a passed out drunk. Use the Syringe on him to get some of his blood. Take a look through the small window. Use the Blood-filled Syringe to attract the hellteeth. Once it gets rid of your attackers, feel free to go out the back door. Go to Doc. Miphidas to find out about the necklace and tissue sample. Next, head to the police station to ask about Mr. Gilbert’s attacker. Show the Bone Knife to Hyevni and give him the Whisky Bottle so he would talk. Head back to Mr. Gilbert’s office to have a chat with Miss Malaguard. Lastly, go to the Manzaran. Tell the voice behind the door that you’re qualified to enter. When it asks for a key, give him the Mysterious Necklace. There's a bunch of games in this series and they're not bad. I played through them all a little while ago. I recommend a look! I played the first episode and was pretty much hooked. I like the atmosphere and the story; as for the concept of a tentacled investigator, that's pretty irresistible. Another nice thing is way the game keeps track of important information so it's easy to access it again. I bought the complete edition, because this is definitely a developer I want to support.